Ernst's Economy for you: Does all the American and European QE and near-zero interest rate money in the world end up in Silicon Valley? As it does not trickle down to the real economy, seemingly. Does all the American and European QE and near-zero interest rate money in the world end up in Silicon Valley? As it does not trickle down to the real economy, seemingly. Last week was a normal week in The Netherlands, without very conspicuous news. 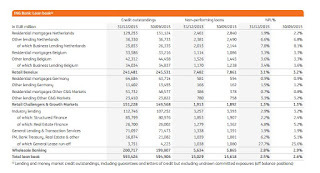 ING bank, one of the so-called 'Global Systemically Important Financial Institutions' or GSIFI banks – and on top of that one of my former employers – presented its Q4 quarterly report with a summary of the annual results. These results were seemingly outstanding, with an annual profit for the bank for 2015 of more than €4 billion euro. The first thing that struck me was how enormously important the residential mortgages still are for ING, with over €277 billion in residential real estate (RRE) loans on a total loan book of €593 billion. Even though the Dutch housing market suffered from more than 30% in price drops during the crisis years, residential mortgages are still a large cash cow for ING. And then I looked at the amounts for Business Lending in this chart. I am always extra interested in business lending, as this was a department where I spent six very informative and pleasant working years and where I learned a lot about banking, loans and credit lines for Small and Medium Enterprise companies. The second thing that struck me, was how relatively unimportant financing of SME companies (i.e. business lending) is for the bank as a whole, in comparison with the amount in RRE loans: only €94 billion of the total loan book is spent on business lending. And the third thing that struck me in the aforementioned chart was that ING’s domestic market, The Netherlands, was ‘fobbed off’ with ‘only’ €25 billion in SME loans; almost €10 billion less than Belgium (€34 billion), a country with 6 million inhabitants less than The Netherlands (respectively 11 million inhabitants for Belgium and 17 million for The Netherlands). I even would not be surprised when these loans for Belgium are actually deployed in Flanders alone in most cases, the Dutch speaking part of the population, including Brussels: a part of the country which has only 7.4 million inhabitants. In my opinion, it can be expected that people and companies in Wallonia – the French speaking part of Belgium – will rather do business with French-oriented banks, like Société Générale or Crédit Agricole, than with the Dutch-oriented ING bank, even if I can’t prove that. This would mean that roughly 8 million inhabitants of Belgium received €34 billion in SME loans from ING, against the €25 billion that 17 million Dutch inhabitants received in total. Probably one of the reasons for this conspicuous phenomenon – one that I already heard back in 2014 – was that the risk management of SME credit for the Belgian market stood at a higher level than risk management for SME credit in The Netherlands. Roughly translated, this means that the risk that banks suffer from under-performing and non-performing loans is substantially lower in Belgium than in The Netherlands. What surprises me, however, is that this phenomenon did not change in the two years after I heard it first. And that the situation with SME and retail companies is still below par in The Netherlands, seemingly. Belgium is one of the few countries where the indexed wages (red line) between 2005 and 2015 have actually risen considerably. 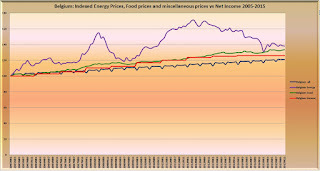 Except for the categories with low price elasticity Energy and Food, there has not been a considerable inflation for the other categories. 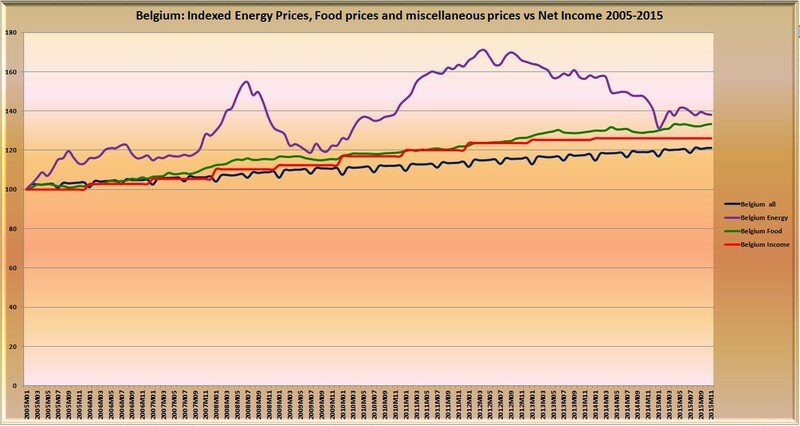 Particularly in Belgium, one can see clearly that the dropping energy prices of 2015 will have a strong downward effect on the Belgian inflation rate. 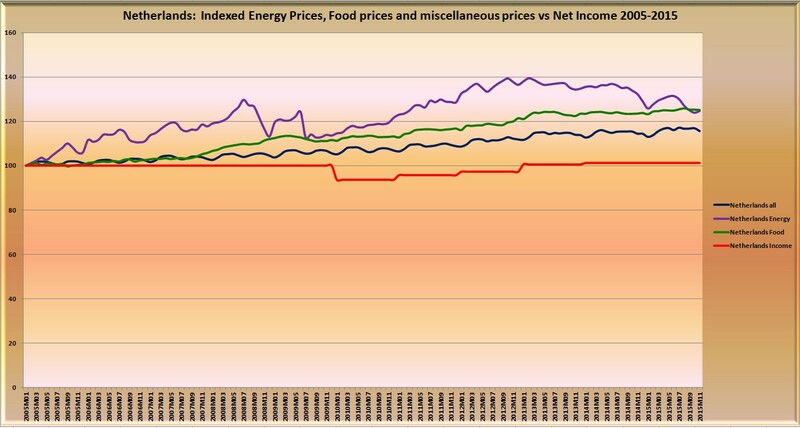 In Italy, The Netherlands and Spain wage development between 2005 and 2015 was close to nought, while energy and food were nearly the only triggers for inflation. Therefore one of the reasons for the circumstance that SME companies in Belgium are allegedly healthier than the Dutch ones, could be the fact that the purchase power of Belgian citizens remained better intact than that of their Dutch counterparts. People with their purchase power intact are of course more spending-happy than people who saw their purchase power erode during the last decade, due to a lack of wage increases and years of substantial inflation and strongly elevated taxes. 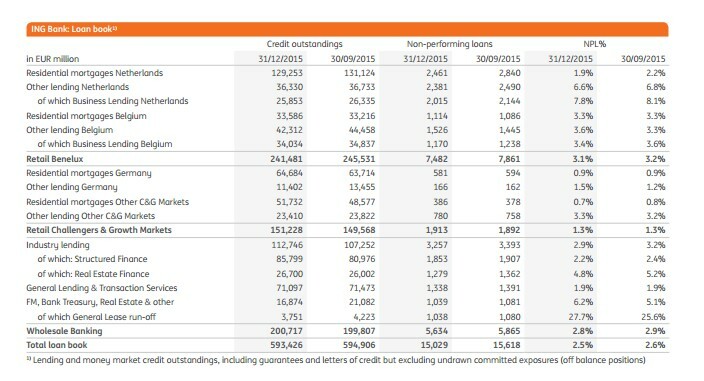 Perhaps ING is an outlier regarding SME loans to domestic customers in The Netherlands. Perhaps the other large banks Rabobank and ABN Amro do lend more to Dutch small and medium enterprises and retailers. Yet, I would be really surprised when that would be true actually. What may be the cause is not clear yet, but it is obvious that Dutch SME companies and retailers are not in such a good shape that banks actually like to lend money to them. The easiest and most convenient solution is to blame the banks for that, but in my opinion it is defensible to blame this partially on the stagnant wage development in The Netherlands and the consequential erosion of purchase power among Dutch middle class and lower class citizens. And then – on Thursday February 4 – there was a business news broadcast on the Dutch financial-economic channel RTL Z that attracted my attention. Vincent Evers: The current hype in Silicon Valley, leading to start-ups getting outrageous market values, is totally ludicrous. Currently there are more than 151 start-ups with a market value of over $ 1 billion. The value of companies that everyone knows, like Uber ($51 billion), Spotify ($10 billion) and Airbnb ($25 billion), can more or less be defended. These are the champions in their respective markets and make everybody jealous of their success. But what about SpaceX ($12 billion)? And have you ever heard of Xiami? Still this company has a market value of $46 billion! And what about Wework ($10 billion) or Zenefits ($4.5 billion). Have you ever heard of those start-ups?! Everything that would have had a value of roughly $10 million in earlier years, has now a value of $100 million, $1 billion, $5 billion, $10 billion. The interest rates are currently so darn low that the money virtually flows into these companies through the trenches, holes and open windows. Everybody and their sister think that Silicon Valley is king. And Silicon Valley itself?! They think: ‘it’s partytime so let’s party for as long as the party lasts. But when the music stops, we run like hell’. The current situation in Silicon Valley remembers me of the situation in the movie The Big Short. Everybody is waiting when – not if – this bubble is going to burst. Yet, some people become shamelessly rich with this hype. And now the losers start to invest in Silicon Valley: the pension funds and the insurers that invest the hard-earnt cash of the teachers and hospital nurses, for which they must collect sufficient pension money. This must go wrong, but you don’t know WHEN this goes wrong. Everybody is putting his money in Silicon Valley. Silicon Valley is now totally overheated and must crash down. The only point is: I don’t know when that happens, otherwise I would become rich too. Of course, Vincent Everts is totally right with this outcry. This 'ball of billions' can’t go on forever in Silicon Valley and therefore the whole hype there will crash and burn in the end. Yet – and that is the game that everybody is playing currently – every person or company who sells stock, bonds and other stakes in such companies for a higher price than for which he purchased them, is a winner. The sorry meatheads that get stuck in the end with overpriced stock and bonds or worthless interests in defaulted companies, are definitely the losers. And that group will probably not be the fancy business banks, the venture capitalists and private equity investors that currently pay the mega prices for unknown start-ups in Silicon Valley. The million dollar question is however: how can it be that the whole SME industry of The Netherlands – the 17th strongest economy in the world – gets a total amount in loans from the leading Dutch banks, which is probably less than the alleged market value of Xiami ($46 billion), a company that no-one has ever heard of yet? Is this not the craziest situation? And even the total amount of SME loans for Belgium, the 25th strongest economy in the world with a much healthier SME infrastructure nowadays, is less than the alleged market value of Xiami and one or two other start-ups in Silicon Valley combined. This huge ‘swimming pool’ of liquidity that has been created by the European and American quantitative easing initiatives, as well as by the 'kamikaze', near-zero interest rates of nearly all the global central banks, does not trickle down at all into the real economy; except for a few droplets. 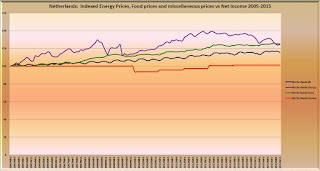 This is the reason that the middle and lower classes in f.i. Europe came almost to a total standstill with respect to their wage development. This is also the reason that countless SME companies and almost the whole retail industry everywhere are still having a very tough time after the crisis, even though the amount of globally available liquidity is nearly endless. 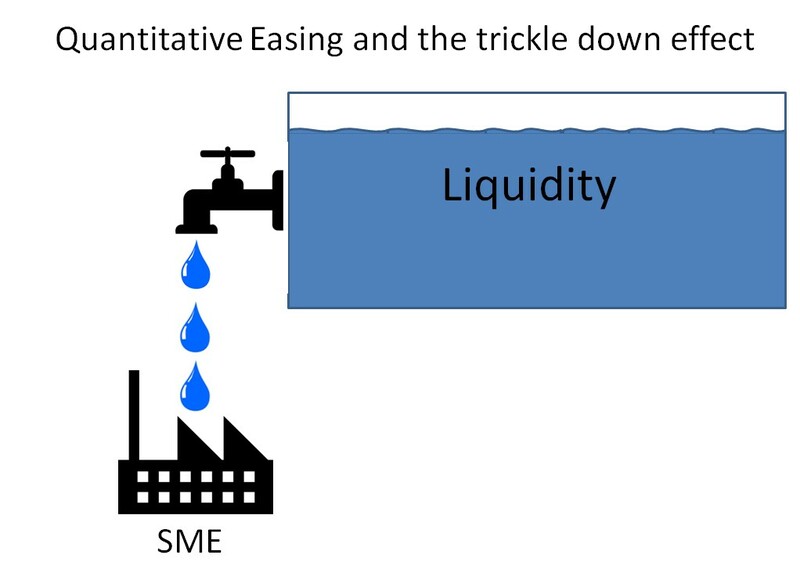 On the other hand, that enormous pool of liquidity is still trying to find a way out as the water tap only lets out a few droplets of liquidity to the real economy. And all that available liquidity should make a decent profit for its borrower anyway, in spite of the near zero interest rates. And I suppose that this new-found, huge water outlet for the swimming pool of liquidity... is Silicon Valley these days.